To Hull and back, a seaside town on the Isle of Wight has been a focal point in AFC Bournemouth’s successes in the FA Youth Cup. While half a century may separate the exploits of Ian Hailes and Jake Scrimshaw, both were born and raised in Ryde, a resort noted for its pier, ferry and expansive sands. Teenager Scrimshaw has played a leading role in putting the Cherries on the footballing map this season, his six goals spearheading them to the quarter-final of the FA Youth Cup for only the second time in the club’s history. And when Alan Connell’s charges tonight host Manchester City, they will bid to match the class of 1969 by reaching the last four, a feat achieved 50 years ago as Hailes helped pull the strings in the Cherries midfield. Under the management of Tony Nelson and legendary trainer John Kirk, the Cherries set up a two-legged semi-final against Sunderland after triumphing at Hull City’s Boothferry Park in the last eight. Their run had seen them overcome Weymouth, Southampton and Plymouth. 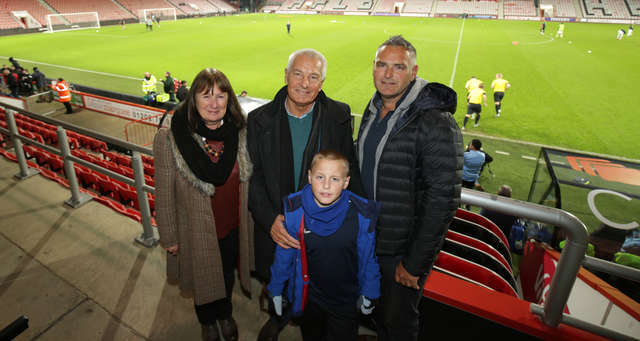 “There were close to 20,000 at Roker Park for the first leg,” said Hailes, pictured at Vitality Stadium with wife Maggie, son Lee and grandson Ian. “It was a massive crowd and something we weren’t used to. We were a Third Division club’s youth team and they were in the First Division. They were the bee’s knees at that time. “They had a brilliant youth set-up and were always in and around the FA Youth Cup finals. We were well beaten. Hailes spent two years as a professional with the Cherries before returning to the Isle of Wight to play non-league for Newport. He also represented the British Rail national team, having worked on the railways after leaving football. He added: “We had a really good youth set-up. We did so well in the FA Youth Cup that Harold Walker paid for us to go to Holland to play in a tournament. “I roomed with David Jones who went on to play for Wales. We both joined Bournemouth at the same time from Portsmouth after they had scrapped their youth and reserve teams. “A few of our team went on to play professionally, players like Eddie Rowles, Dennis Longhorn, Allan Summerhill and Pete Harman. “It’s a great achievement to see them go so far this season and it’s even harder now than when we did it. “There is a lot of money being spent on youth academies, a lot more than in the past. In those days, it was the best of the local players playing for their local clubs. “Scouting networks now are spread much wider and clubs are getting players from farther afield, all over Europe. Hailes was alerted to the Cherries’ FA Youth Cup heroics by son Lee, who played football with and attended the same school as Lee Scrimshaw, father of Jake. Pictured above (back row, left to right): Nigel Ryan, David Jones, Andy Christmas, Dennis Longhorn, Ron Tilsed, Allan Summerhill, Peter Harman, Chris Foote (front) Keith Lawford, Chris Martin, Phil Morrell, Alan Green, Bobby Dennett, Bobby Reeve, Ian Hailes, Eddie Rowles.